One of the more noteworthy independent band stories of this year is the full length feature motion picture documentary, Won’t Anybody Listen (www.anybody listen.com) featuring Anaheim’s NC-17 (www.nc17music.com). Seven years in the making, director Dov Kelemer followed NC-17 as they rehearsed, composed, recorded music, and played clubs in OC/LA. Intercut with interviews with music press, and music industry executives the film was picked up by the prestigious distributor Seventh Art Releasing. The distribution contract resulted in theatrical screenings in nearly every major U.S. city as the film received rave reviews by Variety, The Hollywood Reporter, The New York Times, The Los Angeles Times, among others. Robert Redford’s Sundance Channel has purchased U.S. television right and has began a series of showings that will continue over the next two years. Brothers Frank and Vince Rogala with Robin Canada created NC-17 in 1990. The trio had previously performed and recorded together for several years in a “techno rock” band called Exude, which among other accomplishments was the only unsigned band ever featured twice on MTV's Basement Tapes (the band's Safe With You video won the final Basement Tapes competition) and was lauded as the best unsigned band in America by Musician Magazine (chosen by judges Elvis Costello, Mark Knopfler, T-Bone Burnett and Mitchell Froom). Ready to go at the onset of the alternative movement, NC-17 set out on a mission to write and record a collection of powerful new rock songs without the use of a guitar. After months of writing and rewriting, recording and re-recording, NC-17 completed its debut album "The Happiest Place On Earth." Using a distorted Rhodes to take up the slack left by the absence of the guitar, and adding a slew of non-standard instrumentation, effects and recording techniques, "The Happiest Place On Earth" truly sets the unique tone that is NC-17. Shortly after the completion of "Happiest..." the group sought out a bass player for its live show, and was introduced to Ron Perron through a mutual friend. With Ron on bass, NC-17 played a handful of shows in Hollywood clubs. A few months later, Ron introduced the band to his own former band mate Chuck Hohn when the band found itself in need of a live sound engineer. Chuck did sound for a few shows and then made the switch to become NC-17's drummer, with whom the band then continued its steady Hollywood show schedule. 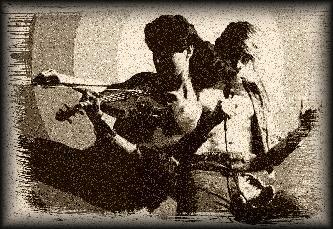 Violinist Robert Anthony Aviles hooked up with NC-17 later in 1992 when he, Chuck, Ron and Robin were invited to play together for a showcase at the Troubadour to back a singer who was an acquaintance of theirs. Robert fronted (and still now performs with) his own band called Insight, which had been a winner on Star Search. The band quickly integrated Robert and his unique style into its already distinct sound, and soon afterward recorded the album "Hellhead" which marked the next step in the evolution of NC-17. NC-17 has completed “Listen” (the album they are documented composing during the film). The band is currently contributing commentary, music and other material to the upcoming DVD. NC-17 completed a string of TV and radio appearances and concerts in Northern Michigan this fall, a homecoming for lead singer, brothers Frank and Vince Rogala.